Look What They Gave Me at the Bank! Wow! Look what they gave me at the bank just for being so incredibly cute! 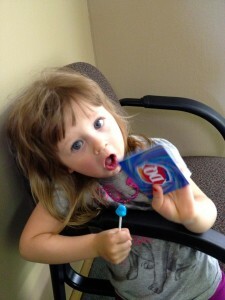 Kaliska Spencer makes a lollipop withdrawal from the Coupland branch of Citizens National Bank every Friday. Today, she was surprised with a special gift: a $10 gift card to Dairy Queen. I think they have more so if you are a customer, you might want to stop in and get one! You just can’t beat having a bank account in a place where they don’t need to see your ID to make a withdrawal. Take your money out of the “Too Big To Fail” banks. They couldn’t care less about you. Do a little research on the LIBOR rate scandal or the so-called “robo-signing” of foreclosures if you have any doubts. This entry was posted in Opinion & Commentary, What's New? and tagged Citizens National Bank, Coupland, Dairy Queen gift card, LIBOR, local banks, robo-signing on May 17, 2013 by Stewart Dale Spencer.